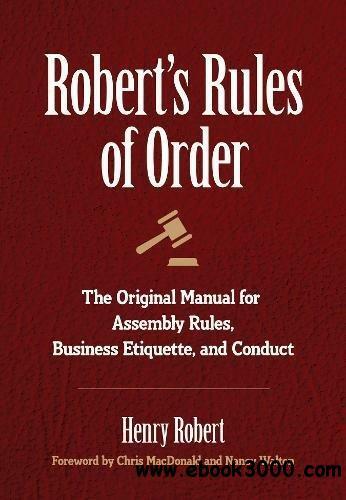 Robert's Rules of Order was originally published in 1876, as a guide for groups when they met to maximize the efficiency of their meetings and conduct their business in an orderly fashion. The book highlights how to properly motion for an argument or change, and the subsequent steps required for a motion to pass. Additionally, it elaborates on decorum, etiquette, voting procedures, positions within the group, and more. Henry Martyn Robert was an American soldier, general, and, most famously, the author of Robert's Rules of Order. He wrote the book after being ashamed by how poorly he had run a church meeting. He passed away in 1923.